Bohemia Interactive feels Steam offers too many advantages for Arma 3 to ignore. 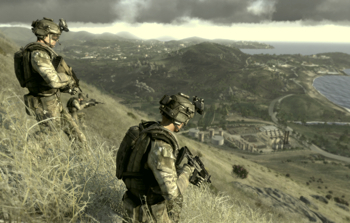 Arma fans looking forward to Arma 3 had better get on the Steam bandwagon, as Bohemia Interactive's latest installment in its military shooter series will be a Steam exclusive. Otherwise, says Bohemia, it couldn't see a 2013 release, but that isn't the only reason Arma 3's going to Steam. "As an independent developer, we're constantly evaluating the way we develop, distribute and publish games," says Bohemia Interactive's Marek Å paněl. "We have evaluated the pros and cons, but in the end Steam enables us to release Arma 3, brings massive advantages to the game, and improves the end-user experience." Besides, he says, the vast majority of Arma's player base already comes from Steam, so for them this oughtn't to be too much of a burden. If you were wondering, yes, this is - at least in part - a piracy thing. Bohemia's done its best to avoid DRM and similar protective tools, but the toll piracy takes on its titles has become too much to bear. "We strongly believe the best anti-piracy comes from offering valuable online services that people are willing to invest in," says Bohemia in a blog post. "Supporting that philosophy: we saw we could not deliver in-house solutions on time, but could take Steam's and expand upon them." That's not to say that there won't be a boxed release. However the boxed release will include Steam codes in a retail package, or contain DVD data to make installation speedier. There will also be offline play support, though naturally offline play precludes multiplayer. As for a release date, 2013 is all anyone knows right now, but Bohemia thinks it's in the final stretch.